Lucky Bucket Brewing and Omaha-Real Beer for Middle America! Omaha, somewhere in Middle America. Every juke box in bars around the US and beyond has played this song for decades. Though “Omaha” may have only been used because it sounded right lyrically, it does make people wonder about this place described only by a vague geographic location. Where is Omaha (besides somewhere in Middle America), how big is it, what do people do there? I’ve seen About Schmidt, heard Peyton Manning bark out an audible, and I know it was a Normandy Beach, so why all the references to this town most people fly over? While we’re at it, I’ve never heard of an Omaha beer, what does Warren Buffet drink when he cozies up to the bar rail? Let’s do a little Omaha overview before filling up your Lucky Bucket (clue on what’s to come). Don’t worry, this won’t be a street by street or museum by museum run down because that’s not who we are. What I will tell you is that Omaha has as many bar options as any medium sized city you’ll visit. From corner bars, to craft beer bars, to bier halls, and places with champagne on tap this city has you covered. It’s a city that loves events and hosts them with pride. The CWS is a must attend event for baseball lovers and those who just want to be welcomed by smiling folks on a hot June Day in the Heartland. It’s a great city in the heartland to meet people and have a good time. The "Macro" influence is still there, but going away! With an over abundance of Czech, Polish, and German heritage running through Omaha’s veins, the popular drink of this city is beer. With that in mind, Omaha and beer were 2 words that didn’t go together for a stretch of around 20 years. With the closure of the final Omaha “Big 4” breweries the natives of this Great Plains town were tossed into 3 buckets (Milwaukee, St. Louis, Golden). Sure you could get a Boulevard from KC here and there or a Leinie’s from Chippewa Falls, but they weren’t everywhere and they weren’t local. This left the door wide open for someone with a passion for real beer to step up and serve this city of beer drinkers some cold ones worth drinking again. In 2008 a group of garage brewers and brewpub employees tinkered with, drank a lot of, and perfected a pre-prohibition style lager. 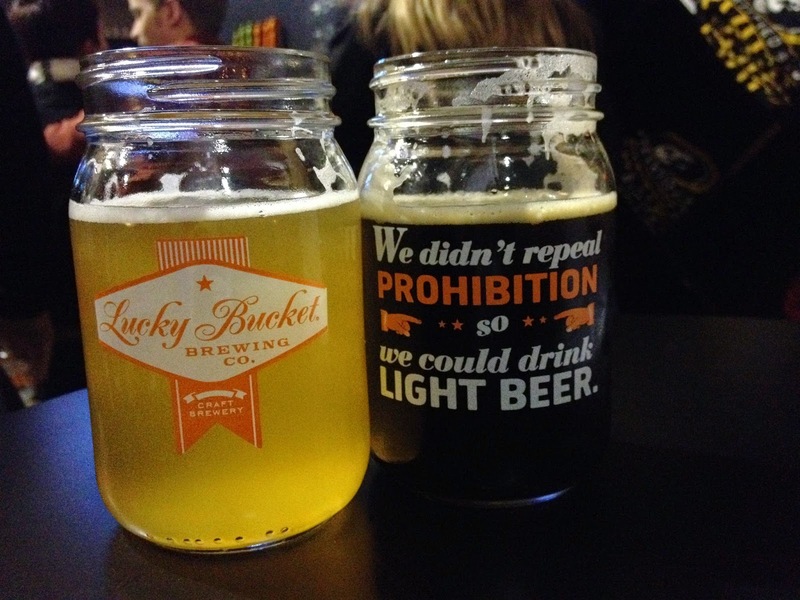 The Lucky Bucket Brewery was born so Omaha and beer could be words that went together again. Lucky Bucket (a name that gives a nod to the past before cans and bottles when you had to take your bucket to the local brewery to get filled) was also a way to keep these passionate brewers busy while the fine spirits that they had just begun distilling aged in barrels for a few years. Yes these brewers have a full lineup of lagers, ales, rum, and whiskey. They double as Cut Spike Distillery (a nod to the railroad history of the area). Let's drink real beer Omaha! Lucky Bucket today is available in 5 states and growing, but our favorite way to get to know a brewery is to take a tour and then hang out in the tasting room. So we bundled up for a winter Friday night in Omaha and headed over to the brewery. This Friday evening happened to be the kickoff of Omaha Beer Week (which included events at all of the new craft breweries and craft beer bars, a testament on how far Omaha has come in a short time) so the atmosphere was more than festive. The tour was informative and enthusiastic. 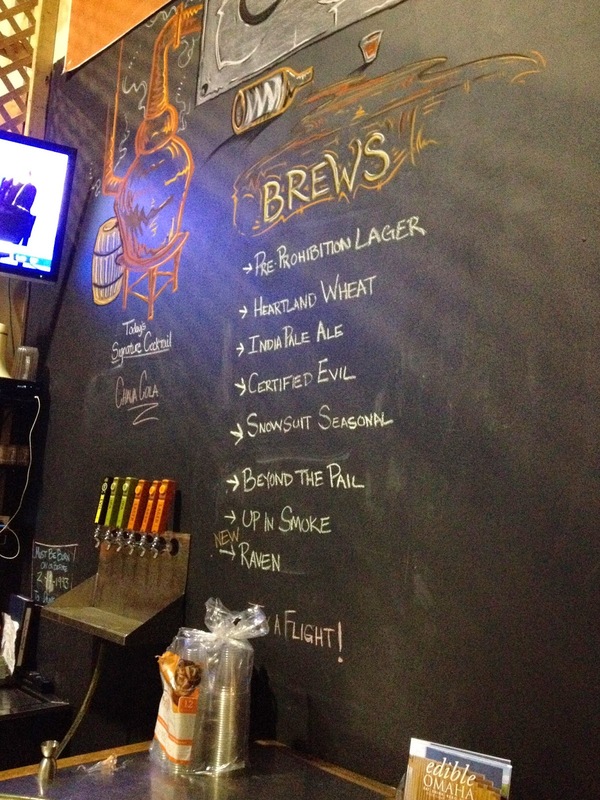 Like all craft breweries we’ve been to, Lucky Bucket’s employees were beaming with pride. Their mantra video shown before the tour was top notch and is a must watch for those passionate about beer. We wound our way through bottling, packaging, fermenting and staging as all brewery tours do. The Lucky Bucket team engaged us with a complete brutal honesty that you find from teams of brewers that don’t put money before quality. The stories told ranged from hilarious mishaps with the German purchased bottling machine with no instruction manuals, to some of the original batches of lager that weren’t fit for a bottle. The care and time put in by this team shows in their beer, which happened to be the last stop on the tour route. The tasting room was an extension of the brewery instead of a walled off room which we enjoyed. It made us feel like we were part of the brewery instead of being in just another bar. The selection (which is why people should tour breweries) was wider than what you find in the store or on tap all around town. Special beers, seasonal, and new flavors were on tap and ready to be tested in a flight or our favorite, in mason jars. You could also pick up bottles or growlers from the tasting room for consumption in home when you need something worth drinking in the house. The first beer I grabbed was the original Lucky Bucket Pre-Prohibition Style Lager. As with our tour of Capital Brewery, the folks at Lucky Bucket are proud to be lager brewers and sell more lager than any other style. The Lucky Bucket Lager had real malt and hops flavor (unlike the macro brew lager) almost rebelling against what the public had been indoctrinated to what a real lager is supposed to taste like. This beer was golden in color and easy to drink. Not every craft brewery takes a swing at lagers, but Lucky Bucket takes that swing and knocks the lager out of the park, which is why this lager has won medals at various world beer championships. We also tucked in to the Raven (Lucky Bucket’s black IPA) and The Heartland Wheat. The wheat was an easy drinking ale with a great citrus note and is made with some love of middle America with wheat from the heartland. It was crisp and refreshing making us long for summer while staring outside at the frozen February landscape. The Raven was a solid black IPA with a bitter citrus hop and the coffee and roasted malt aroma you’d expect in a black beer. This was a perfect warm up beer for the barren frozen landscape that we were still staring at outside. The Lucky Bucket and Omaha experience is what you should come to expect in the American Midwest. Good people, world class hospitality, and in terms of Lucky Bucket you get top quality beer. Whatever you are looking for from a drinking establishment, you can find in Omaha, and because of the emergence of local craft beer like Lucky Bucket you can enjoy great craft beer all around town. Bring your friendliness, because nobody in Omaha is a stranger. and get your money back at the door.